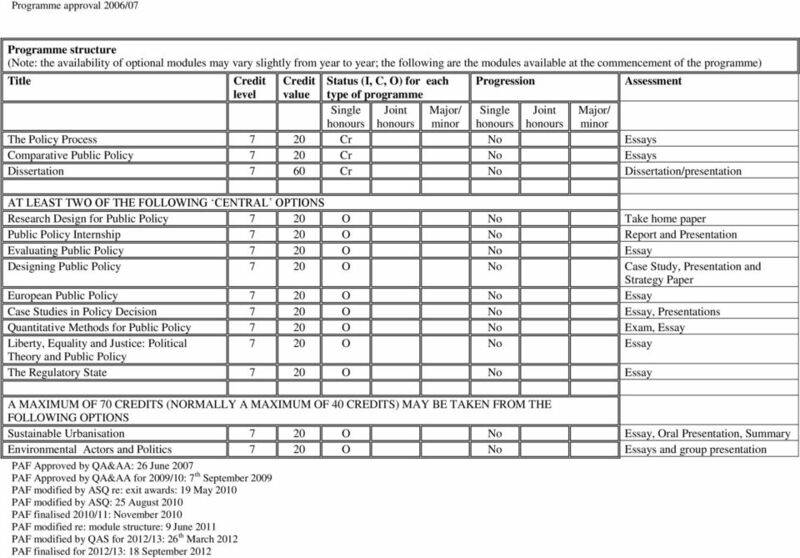 Download "Any special criteria equivalent MA Public Policy 180 210 90-105 N/A 3. 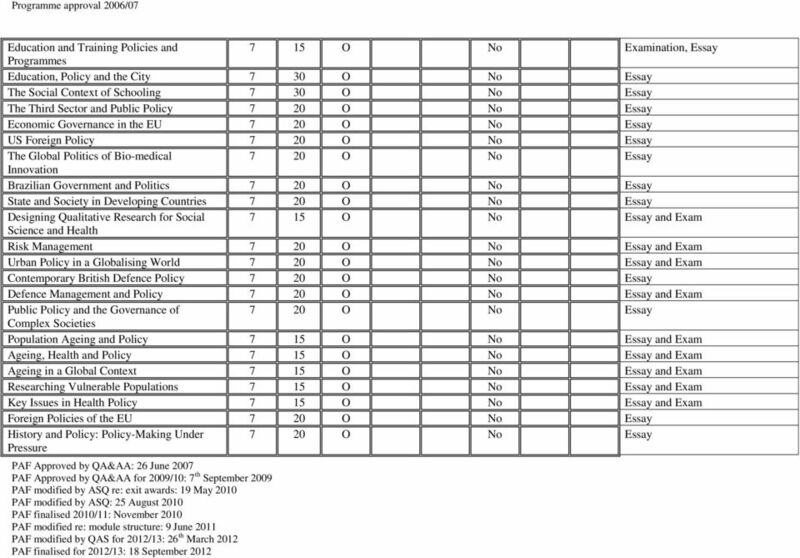 Nested award Award Title Credit value ECTS"
11 Public Policy and the Global Financial Crisis 7 20 O No Coursework 20. 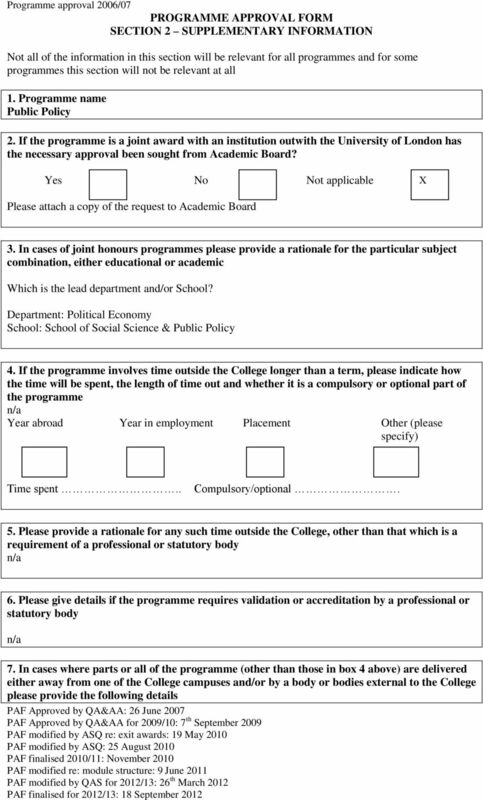 Marking criteria The College generic criteria for assessment of postgraduate work apply to the assessment of this Programme, with the addition that no mark in any element may fall below 40%. 21. 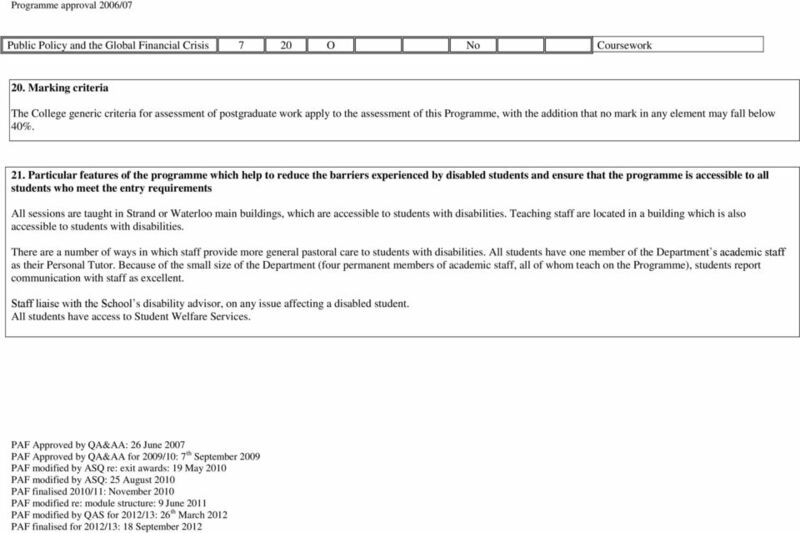 Particular features of the programme which help to reduce the barriers experienced by disabled students and ensure that the programme is accessible to all students who meet the entry requirements All sessions are taught in Strand or Waterloo main buildings, which are accessible to students with disabilities. Teaching staff are located in a building which is also accessible to students with disabilities. There are a number of ways in which staff provide more general pastoral care to students with disabilities. All students have one member of the Department s academic staff as their Personal Tutor. Because of the small size of the Department (four permanent members of academic staff, all of whom teach on the Programme), students report communication with staff as excellent. Staff liaise with the School s disability advisor, on any issue affecting a disabled student. All students have access to Student Welfare Services. 1. Programme title and designation MSc/Master of Public Health. 2. Final award Award Title Credit. ECTS Any special criteria. ECTS equivalent. 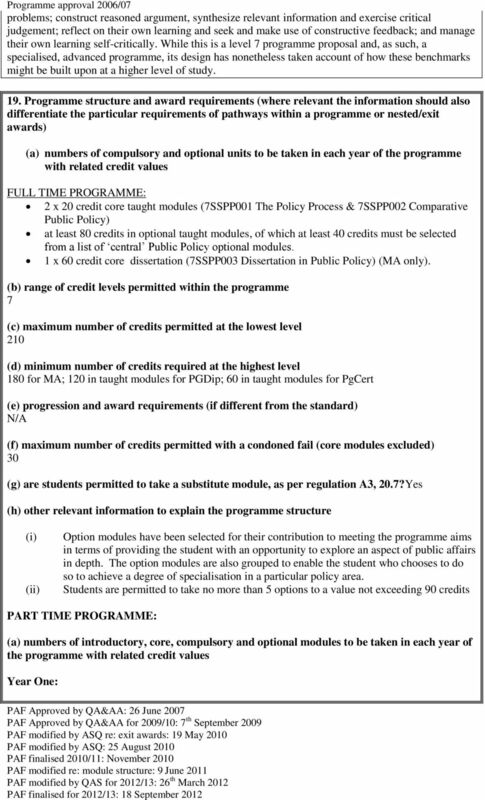 Any special criteria PGDip International Marketing 120 60 Students undertake 120 credits from taught modules 4. Exit award. 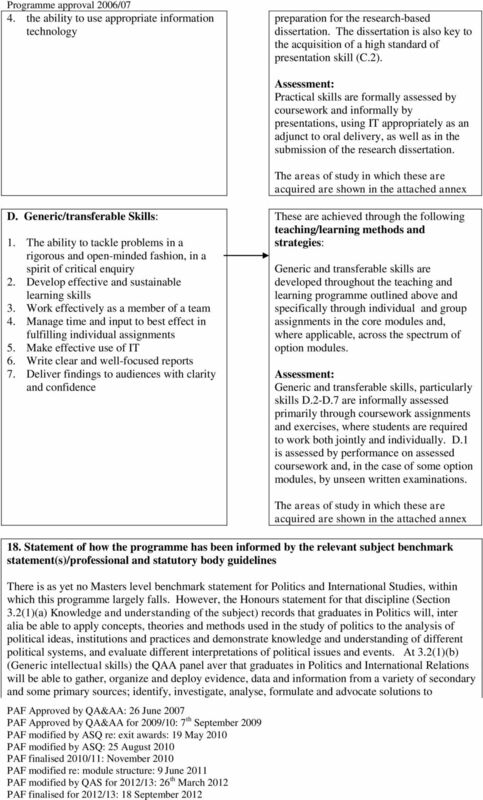 PROGRAMME APPROVAL FORM SECTION 1 THE PROGRAMME SPECIFICATION. Any special criteria Accounting, Accountability MSc. value Equivalent. Credit. 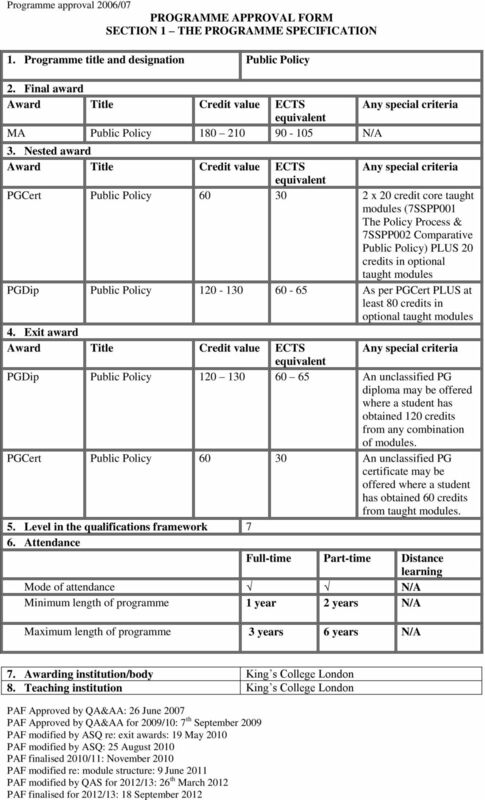 THE PROGRAMME SPECIFICATION. 1. Programme title and designation MA Religion in Contemporary Society 180 90 N/A. Value equivalent. 1. Programme title and designation ibsc Health care management For undergraduate programmes only Single honours Joint Major/minor. PROGRAMME SPECIFICATION Final. PGCert Criminology and Criminal Justice. 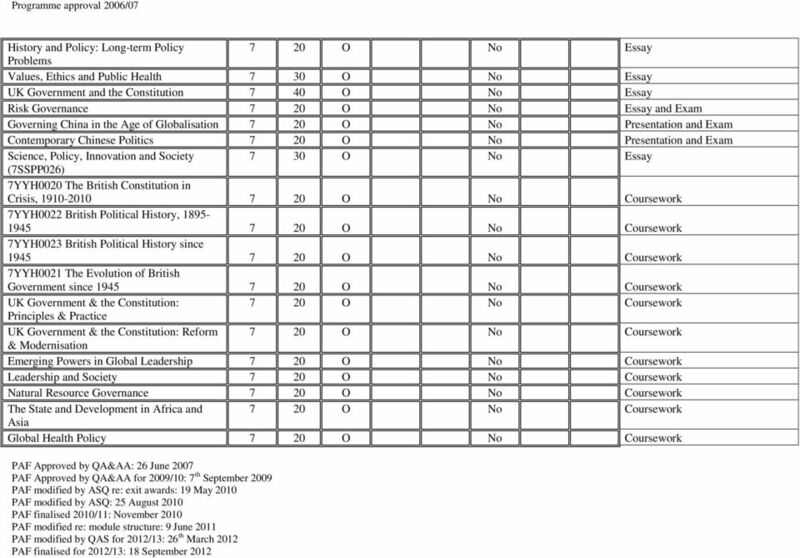 Name of institution Host department Course status 1. SELECT 2. 3. MSc Security Management (Campus based) Programme Specification Primary Purpose: Course management, monitoring and quality assurance. Secondary Purpose: Detailed information for students, staff and employers. 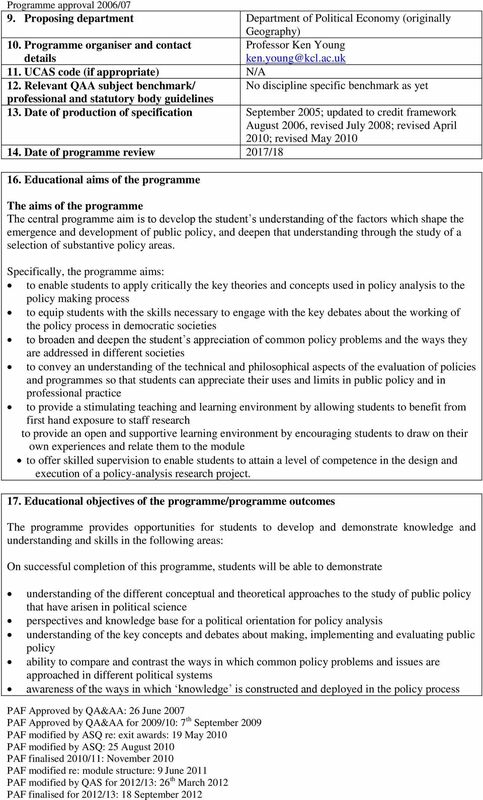 MA in European Public Policy Overview Brussels is the centre of European decision-making. It is estimated that some 60% of national legislation of EU Member States originates, in some form, in Brussels. N/A. Prior Qualifications. Aptitude Test. International Applicants (Non-INTO Queen s applicants) An overall average of 60%. All modules passed.